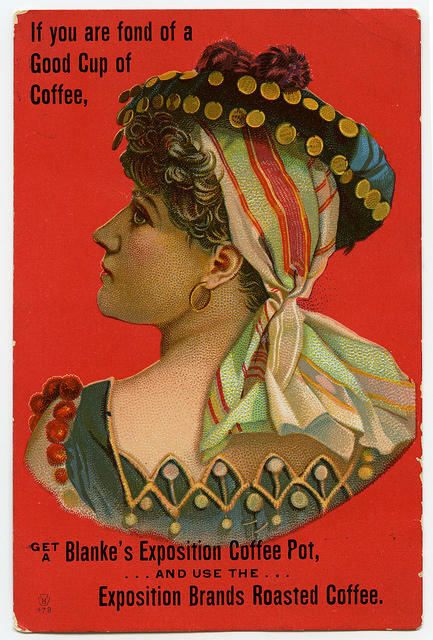 Advertising card for C.F. Blanke's Coffee, circa 1904.
Credit Missouri History Museum Photos and Prints Collection. "St. Louis on the Air" host Don Marsh speaks with Katie Moon, the exhibits manager at Missouri History Museum responsible for "Coffee: The World in Your Cup and St. Louis in Your Cup." At the turn of the 20th century there were around 80 different coffee roasters in the St. Louis area, said Katie Moon, the exhibits manager at the Missouri History Museum and content lead on the museum’s most recent exhibit on coffee, opening Oct. 3. The history of coffee in St. Louis had started as far back as the early 1800s, when coffee shipments came from New Orleans up the Mississippi to St. Louis. The Great Depression, World War I and national advertising for coffee brands took off all contributed to the downslide of coffee roasting in St. Louis, Moon said. But that’s not the end of its history here. The Blanke Tea and Coffee Co., Jas. H. Forbes Tea and Coffee Co., Hanley & Kinsella Coffee & Spice Co., Old Judge Coffee Co., and even Dana Brown’s Safari Coffee all made names for themselves in St. Louis. Today, there are around 20 different coffee roasters in the St. Louis area, Moon said. These include big names like Ronnoco and Kaldi’s, but also smaller shops like Chauvin and Blueprint. Share your St. Louis coffee memories. Perhaps the most exciting part of Wednesday’s “St. Louis on the Air” was hearing your memories of coffee in St. Louis. Here is a selection. If you have an especially poignant memory, send it to us here at talk@stlpublicradio.org, and we’ll add it to the story. Open Wednesday-Monday, 10 a.m. to 5 p.m.